Every golf ball has numbers on it. How many numbers and which numbers vary from brand to brand, but they all have at least one number (typically a single-digit number) printed on them. Let's go over the numbers that appear on golf balls and explain why each is there. What does this number below the brand name mean? Nothing, really. These single-digit numbers are simply there for identification purposes. 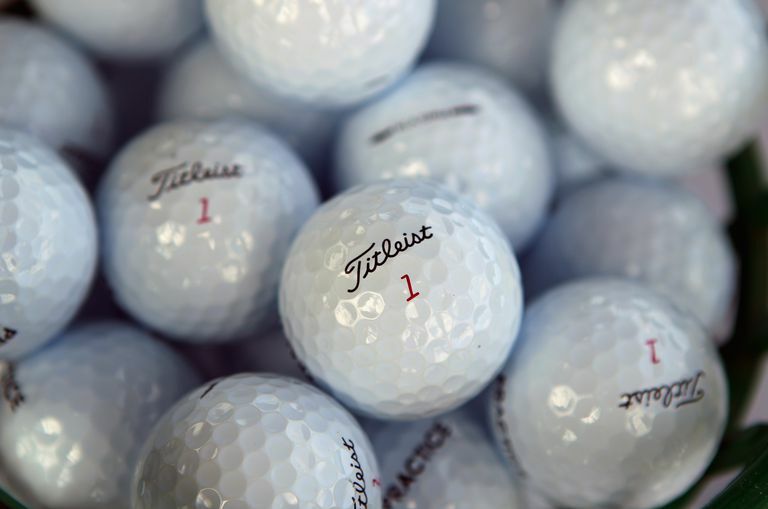 Say you and your buddy both play the same golf ball—a Titleist Pro V1, for example. You want to make sure you can tell them apart during the round, and using balls with different numbers can help you do that. Player A might choose a ball with a "1" while Player B uses a ball with a "3." As noted, these types of golf ball numbers usually appear just below the branding of the ball's name, near the equator. If you purchase golf balls by the sleeve, all the balls within a single sleeve will have the same single-digit number. These numbers are usually black, but sometimes red. "Back in the old days," as golf oldsters say, a red number was thought to indicate a low-compression ball. That is no longer the case, though. Red, black—today the color doesn't indicate anything special. A golf ball might also have a three-digit number stamped on it, usually something in the 300s or 400s. If you notice such a number on a ball, this number is letting you know how many dimples are on the golf ball. That number doesn't really give the golfer any kind of insight into the golf ball's performance or quality. But some manufacturers like to brag about their dimple patterns and so some include the number on balls. Another number that might appear on golf balls is the ball's compression rating, although compression is no longer a major selling point for most golf ball manufacturers. Until solid-core balls drove the wound ball out of the market—beginning in the late 1990s—compression rating was a big deal to golfers. A compression rating of 70 or 80 for a wound ball was regarded as an indicator that ball was a "ladies ball." A compression rating of 110 meant you had to swing very hard to make that ball work right (the he-man ball). Compression ratings these days can be way down in the 30s or 40s (ranging up to 100 or so). When these low-compression balls first started appearing on the market, manufacturers felt there was still a stigma attached to low compression—i.e., that a low-compression ball would be viewed as a "ladies ball" and male golfers wouldn't buy it. And so numbers representing compression were dropped from most golf balls. You'll still find them on some brands, however, and they are almost certain (these days) to be two digits. What Were Balata Golf Balls, and Can You Buy Them Today?